I’ve previously heard of Ra Ra Riot before, way back via their song ‘Can You Tell’. The song only received a mere shrug from me as it didn’t quite stir up the excitement within and was pale in comparison to the rest of the songs that I was listening to at the time. This time around, I was fortunate enough to bump into another tune by the band, entitled ‘Dying Is Fine’ that glimmered and shone of a lot more promise. 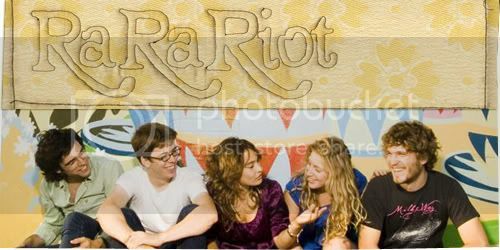 Ra Ra Riot hails all the way from Syracruse, New York, and is a six piece ensemble bearing a set of instruments that includes the violin and cello. ‘Dying Is Fine’ is lightly dipped in an orchestral quality, whereas the rest of the song unveils a straightforward combination of indie rock with chamber pop. Although largely driven by heavy guitar works and dynamic drum sections, with weary lyrics that are as truthful as you’ll ever hear, the tune comes off hesitant and restrained, mainly owing to their self-titled 2007, EP’s production. It’s to no one’s surprise though, that the band has often been made comparisons with Canadian band, Arcade Fire, boldly demonstrated in their “vigor and instrumentation” especially during their live performances onstage. My knowledge of this band may not be as vast as one would presume, but through pertinent observations alone, it isn’t hard to see that the band is destined for a solid head-start to their career.